The Pre-Raphaelite Brotherhood was a group of nineteenth-century English artists who chose to emulate the style of painters before Raphael. This stylistic choice was a deliberate, countercultural move that involved eschewing the muddied, realistic style of painting taught in contemporary art schools in favor of an ideal of perfection derived from early Renaissance, neo-medieval, and Byzantine painting. Art schools of the time encouraged their students to use a dull palette of grays and browns, even going so far as to prescribe the use of a wash or “gravy” to create a uniform and supposedly “realistic” appearance in landscape and portraiture. The Pre-Rapahelites rebelled, favoring a palette of rich reds, golds, blues, and greens reminiscent of Byzantine mosaics, as well as a set of lighting effects often involving an otherworldly golden glow. Above is a painting by one of my favorite painters, Edward Burne-Jones, which exemplifies that color and lighting. Rather than attempting to render nuances of shading in the folds of the red cloth, Burne-Jones uses a pure glowing red that pops against the golden background: a trick used to great effect in the art direction of Demon’s Souls and its precursor, Shadow Tower: Abyss. The Pre-Raphaelites exerted a powerful influence on some twentieth-century fantasy artists, such as Robert Gould. Gould, one famed illustrator of Michael Moorcock’s Eternal Champion saga, formally organized a circle of artists who would emulate the Pre-Raphaelites. 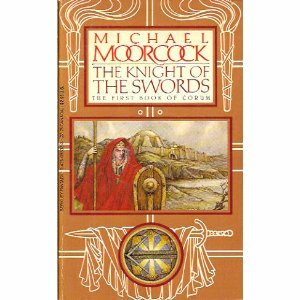 The influence of the Pre-Raphaelites is readily apparent in this cover art from The Knight of the Swords, right down to color palette, lighting, and the crisp rendering of cloth in a neo-medieval scene. There are many connections between videogames and the Pre-Raphaelites, including Irrational Game’s recent declaration of gray as the “color of girly-men” in their E3 manifesto on the art style of Bioshock: Infinite. A videogame with a deliberately Pre-Raphaelite art style would be an interesting alternative to much of the gray murk found in RPG’s and shooters, and careful use of cel-shading and lighting could no doubt create a haunting, otherworldly experience in a fantasy RPG. That said, the Pre-Raphaelites are ultimately less interesting for their specific stylistic features than for their deliberate decision to emulate a past style for a particular aesthetic effect. Matthew Weise, the lead designer at M.I.T. Gambit whose insights I never cease to quote, has observed that indie game designers often see the art styles of games from the 8-bit, 16-bit, and 32-bit era as valid stylistic choices rather than limitations. (Think Cave Story, Braid, or symphonically stirring chiptunes). 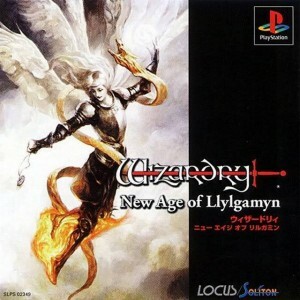 It’s because of the extended stylistic palette afforded by retro-gaming that I’m often more excited about discovering strange, obscure, or otherwise unique PS1 or Dos games than I am about playing recent current-gen games, and I find my backlog from 10 or 20 years ago much more urgent than the one from 1 or 2 years. I’d rather be playing Thief: The Dark Project than Dragon Age 1 or 2, and a refrigerator box full of unopened Dos adventure games holds more wonders than most of IGN (as does the Japanese-only PS1 remake of Wizardy IV: The Return of Werdna and Wizardry V: Heart of the Maelstrom that I accidentally discovered while researching this post). It’s not that older games are “better,” whatever that might mean, but that some of them have powerful design lessons to teach. The first lesson I’d like to look at in a future blog post is that first-person perspective can be used effectively to increase immersion when players are allowed to do something other than shoot. From first-person dungeon crawlers like Wizardry blossoms a lineage that leads to Thief, the extended King’s Field franchise (including Demon’s Souls), and Amnesia: The Dark Descent. And that’s why I temporarily rolled my nVidia drivers back more than a hundred releases this morning, because such a hardware nuisance is worth it to play a gem like Thief, even though I know I’ll have to roll them forward again everytime I want to work with 3ds Max or Unity.